Everyone loves the sherbet flavor of a push-pop. Dreamsycle flavored shaved ice syrup from Hawaiian Shaved Ice offers that same great taste, but on a snow cone! It will be hard to resist this sweet, smooth treat. It is the yummy flavor of a dreamsycle push-pop combined with the frozen deliciousness of a sno cone. Enjoy this shaved ice on a hot summer day for instant relief and satisfaction. 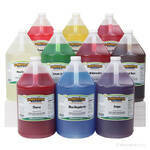 Dreamsycle shaved ice will become a crowd favorite at your party, or just in your kitchen with your family! It�s a treat that everyone can enjoy! 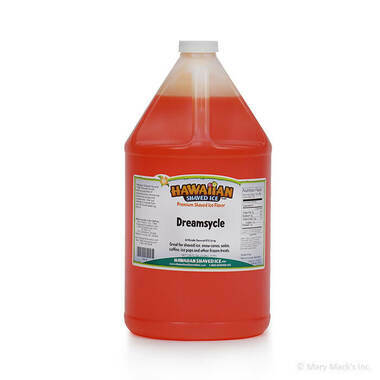 Pour this orange dreamsycle flavor on your next snow cone. Kids will love the push-pop flavor. 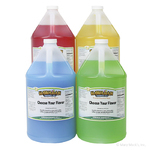 You should probably go ahead and buy the gallon, you know you�ll be coming back for more! 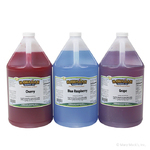 This delicious snow cone syrup is also sold in the gallon sizes, or in an assorted package so you can enjoy more classic flavors.